The Emerging Scholars Network is composed of students and next generation leaders who are dedicated to advancing the emerging field of planetary health through local community efforts, educational events, and research projects. The Planetary Health Alliance works to support these efforts by providing introductory resources, workshop materials, and mentorship opportunities. Scroll down to browse the list of planetary health clubs around the world, and contact a local group to get involved. Interested in establishing your own club? Check out the "Building A Planetary Health Club: A Ten-Point Guide" for assistance on how to get started. Each semester, the Planetary Health Alliance seeks applications from undergraduate and graduate students committed to being "planetary health ambassadors" on their campuses. This entails organizing local events and educating their community about planetary health. For more information on this program, visit our Planetary Health Student Ambassador page. Subscribe to the Emerging Scholars Network listserv for updates on next generation events and opportunities. Bangladesh Planetary Health Club (BPHC) started its journey in late 2017 with an aim to promote planetary health among young researchers from diverse disciplines as well as to collaborate with other scholars around the globe. Contact us. The Brandeis Sustainability Ambassadors (BSAs) are a group of students who aim to implement sustainable practices at Brandeis. The BSAs hold weekly open meetings to plan sustainability initiatives and education programs for both students and faculty. The BSAs plan on expanding these programs to highlight the bidirectional relationship between human health and the health of the planet through approaches to engage people from fields of study outside of environmental studies. Examples of programs are faculty panels, movie screenings and discussions, and hands on outdoor activities. Contact us. The University of the West Indies young scholars group focuses on understanding the concepts of planetary health and how they relate to the Caribbean setting. The group holds quarterly journal club meetings, which engage members from across the Caribbean virtually and discuss current research in the area of planetary health. The group seeks to embed planetary health within the education system in the Caribbean and create a community of practice for planetary health. Contact us. Health and Environment at Yale (HEY) is an interdisciplinary student group linking students, staff, and faculty from across Yale, including the School of Public Health and the School of Forestry & Environmental Sciences, and sometimes beyond to groups in New Haven and nearby college campuses. The members of HEY have a shared interest in bridging environment and human health and seek to forge connections with future colleagues from all disciplines. Throughout the year, HEY holds social networking events, seminars with host speakers, journal clubs, career and research talks, and movie screenings. Topics discussed include (but are not limited to): food security, vector-borne/zoonotic diseases, climate change, green spaces and mental health. Contact us. The Human and Planetary Health Society has a body of around 30 students. Our group will be focused on spreading green or sustainability initiatives across campus along with educating the members, campus, and surrounding community about this topic of human and planetary health. Contact us. Human Health and Climate Change (HHCC) is an interdisciplinary student organization at UCSF interested in creating awareness and enacting change at the intersection of climate change and human health. We are a community of passionate students and faculty that develop projects around sustainability, curriculum reform, research, advocacy, and educational events related to planetary health. Contact us. The LSHTM Planetary Health Network (PHN) aims to engage students, researchers and the public in the planetary health research and policy-making agenda. We have a Steering Committee consisting of early career researchers and MSc Student Ambassadors that meets for monthly planning meetings. PHN activities include managing a mailing list of Planetary Health Network members (~70 and growing), distribution of a quarterly newsletter and regular updates on planetary health news and activities, and organizing seminars, film screenings and social activities. We are also planning various public engagement activities. We are currently one of the few inter-faculty groups at LSHTM, and therefore we are a unique platform for engaging across the staff and student body. For more information, please see our Facebook Page. Contact us. The mission of the Planetary Health Network at UBC is to build a network of people who are already working in this field and to activate and support these people in raising awareness and providing education around planetary health issues. The Network supports faculty, staff, and student body members in connecting with each other and in sharing their knowledge and experience. By focusing on the health impact of disrupted natural systems, it provides an important viewpoint in UBC’s sustainability efforts. The Network will achieve this by providing platforms such as mini lecture series, “brown bag lunches”, round tables, and journal clubs for interested individuals to come together, to network and to exchange knowledge. It will also aim to organize a campus-wide event (e.g. in the form of a local conference) to reach an even larger audience and has been coordinating its efforts with other campus-based initiatives such as the Healthy Cities Forum. Contact us. The Standing Committee on Climate Change and the Environment was founded in October of 2017 in Honduras. The committee is part of the International Federation of Medical Students’ Associations of Honduras. The committee’s main objective is to educate medical students across the country on the human health impacts of climate change and environmental disruption. Currently, the medical curricula in Honduras lacks a component on climate change and environmental disruptions, which results in hundreds of future health professionals with a knowledge gap and poor skills to respond to the present and future human health complications of this global health issue. This project addresses the biggest global health threat of this century; climate change.This committee has empowered more than 100 medical students to develop and carry out educational and social activities in the last year. Contact us. SaIZ is a group of students engaged in reducing the environmental impact of the University of Milan and surrounding community. We aim to achieve this goal through the promotion of planetary health, with multiple short term and long-term projects related to raising awareness (conferences, workshops, public demonstrations in order to captive both the academic audience and general public) and lobbying for policy and structural changes (creation of a Green Office, expressing our points to political stakeholders, etc). The group started in the International Medical School and now has members of multiple faculties. We are always interested in partnering with different organizations that advocate for the same goals. Contact us. The Students for Planetary Health Berlin (SfPHBerlin) are an interdisciplinary initiative, found in 2017 by students of Medicine and Geography from several universities in Berlin, Germany. We aim to promote the vision of Planetary Health and contribute to Planetary Health itself. Therefore we connect with other students, initiatives, faculties and organizations - and share knowledge, ideas and experiences about Planetary Health among ourselves and with our partners and audiences. We want to create consciousness in politics and the society, thus we organize workshops and lectures in various settings and for human beings with most different backgrounds. Community-based projects like our 'Cookbook for Planetary Health' and activities in the public space complete our integrated approach. Currently (June 2018) we consist of a core team of seven responsible students assisted by approximately half a dozen supporters. We look forward to getting in touch, exchanging and cooperating with other student clubs and further people and organizations, who share the vision of Planetary Health. Click here to read our latest report of activities. Contact us. The SUNY Downstate Planetary Health Club is developing a planetary health quality of life survey for the community surrounding SUNY Downstate in Lefferts/Flatbush neighborhoods of Brooklyn, NY. Contact us. The Sustainability & Health Student Forum at the Harvard Chan School is a student organization whose mission is to provide public health students a platform for discourse and action on addressing pressing challenges facing the health of people and planet, from climate change and urbanization, to energy and food security, to migration and green healthcare. Contact us. The Sustainable Healthcare Education (SHE) network is a group of clinicians, academics and students interested in preparing "tomorrow's doctors" to work in a sustainable health system. SHE staff representatives are sought within each UK medical school to help to coordinate development of teaching and learning about sustainability within the medical school and provide a point of contact for colleagues or students. Contact us. The Thailand Planetary Health Club's main goals are to develop a short course on transdisciplinarity and ecosystem management for public health students in Thailand; develop with international organizations case studies in the Asia-Pacific region supporting concrete ways to implement the notion of planetary health; and promote knowledge products demonstrating the intrinsic connections between ecosystems and human health. Contact us. The main objective of the University of Eldoret Planetary Health Society is to educate the student community about planetary health, so that students can work to implement policies and solutions that protect human health and the health of our planet. Our vision is to foster a culture that promotes, protects, and improves our environment, in compliance with safeguarding human health. Our focus is to collaborate with relevant scientific field, policy makers, the local community and other interested parties; support and implement variation of activities; and to create awareness, in order to optimize the wellbeing of human as well as the environment. Contact us. 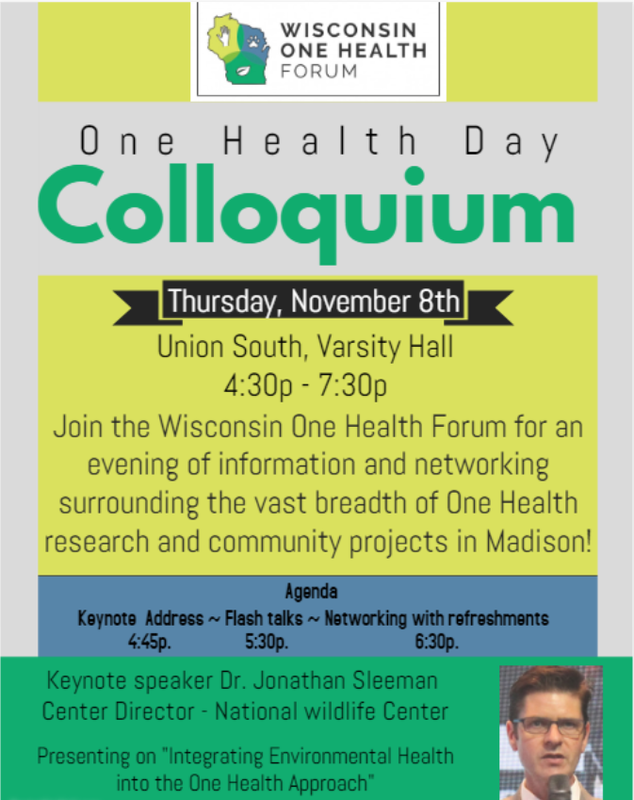 As the Wisconsin One Health Forum we strive to advertise the importance of the one health concept by hosting interdisciplinary and inter-professional events that encompasses human, animal and environmental health. Some of our events include monthly seminars, happy hour presentations, movie screenings, and the One Health Colloquium. Contact us. Club not listed? Contact us at pha@harvard.edu. The Planetary Health Student Ambassador Program is a competitively-awarded leadership opportunity for undergraduate and graduate students committed to educating their campus community about planetary health. Check out the January-May 2019 cohort.